We live in such a culture of ’SELF’ in the developed world. I know firsthand, I have grown up in it. From the time we enter the world, as children unable to understand or comprehend the world around us, we are bombarded with messages from society, media and culture to look out for number one, to do everything you can to help yourself move forward even at the expense of others, a very individualistic mentality of me and I, with phrases like if I can just get this, and if I can just do that, and if I… you get the idea! Working in children’s ministry with 1-3yr olds, it’s a constant reminder of how innate it is to our very being to ensure my needs are met, that I am happy, that I have what I want – that learning how to share is one of the biggest challenges and one of the first biggest lessons that we have to learn as a child – because it does go so much against what is inbuilt into us in this culture of SELF. However I have recently been pondering on, and so challenged by the culture of community that is so apparent in these poorest of poor African communities that we serve in. I always love watching our children eat. It’s one of my favourite things to do, because in it there is no sense of self, only community. There will always be brothers and sisters sharing their plate of food with younger siblings, there will be friends sitting around and putting food and drinks into each other’s cups and plates. Just this week in one of our communities here in DRC called Kikula community, 3 of the older boys, knowing this is their only meal for the day, combined their three plates of food and invited me to join in sharing their meal for the day. Now you might ask how I can knowingly share in their only food for the day, when I know I will be going home to eat a meal for dinner and will wake up to breakfast in the morning also. But it actually sends a very bad message culturally to reject such an offer. So humbly, we sit and eat together, and the boys laugh and joke as we do. Community is such a natural part of who they are and this simple act is so SELF-LESS. There is a common question that also comes up in my mind when walking in our communities, where there are always more children in need, than we are able to effectively care for: do you take all the children from a smaller number of vulnerable families and ensure they are fed and cared for; or do you take one of two children from a larger number of families to help lessen the burden in the community across a larger number of families, but knowing in a family of 6 or 8 children for example, 2 may receive a meal each day, while the other 4 go hungry. 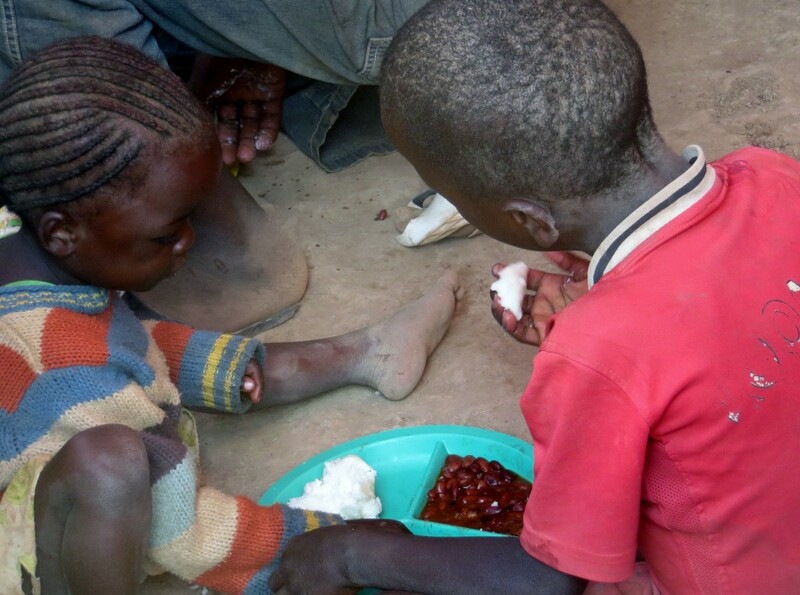 I always think about how the other children must feel, the ones not receiving the food. Do they resent the siblings that are receiving the food? Do they develop a hatred for them? That is what I think my default response would be from my background of growing up in the developing world, and yet in a world of true community culture the family and siblings see the provision for these one or two children as a blessing from God. They are genuinely thankful that at least one or two are provided for, and may grow strong and have opportunities later in life that will enable them to care for the rest of the family. On Friday night this week, I had the privilege of staying in the home of a widow in one of our communities here called Kisunka. This village is very remote and very poor. The widow that we stayed with has 12 living children (she had 16, but 4 have passed away). Her husband died 5 months ago leaving the family very vulnerable. Mama Charlotte is one of our volunteer Care Workers, so in addition to caring for her own 12 children and the many challenges she faces having no source of income, she also gives of her time to care for the orphan and vulnerable children in her community. As we sat around in the dark in her home on the dirt floor, around a small charcoal fire amongst all her children and some visiting neighbours who dropped by, she told us her story. Amidst all the challenges she is facing on a daily basis, she always pointed back to God. Every one of her children knows God. Life is super tough for them, however, in their lack, they open their home and lives with me and share so generously from their lack of resource to ensure my needs are met. They offer their very best to me. In fact when we awoke in the morning they had already been out to fetch some fresh fish (and when I say fresh they were still flapping in the bucket) for our breakfast (which we were able to politely decline – fish and tea for breakfast…not what we were up for first thing in the morning!). But it was them offering me their best, giving from their lack, the true sense of community. Denying my own needs to meet the needs of others: a very challenging and powerful thought. Stanley Grenz is a theologian I studied in Bible College who wrote a book called Theology for the Community of God. He implies through all his theology that we were innately created to live in community; that our very beings thrive on being relationally connected to one another. He argues that God, as the trinity of Father, Son and Holy Spirit, modeled from the beginning community and relational interdependency with one another. Created in the image of God, we are born to do the same. And yet, in many parts of the world today we have lost this, and I believe we have been sold a lie to believe that living for oneself is in fact a better way. If I have learnt anything from these past 18 months in Africa, it is how much I have learnt about community. About the need to die to my own selfish desires, to deny putting myself first, to love and to serve others unconditionally, to share of everything I have been blessed with, with others. I will admit it is still not my first reaction, it is something I am still working on, on a daily basis, but it is something I want to grow in more and more. I, along with 5 other team members from Sunset Church, San Francisco, we will be serving with H@W in Zambia late August. While I am doing my research about the local situation and Kachele Farm, I am thankful to have discovered your blog. Your observation, thoughts, and writing are very inspirational. Praise The Lord for his gracious hand in your serventhood and in the local communities. “Denying my own needs to meet the needs of others: a very challenging and powerful thought.” Indeed!